Happy Tuesday crafty friends! It's Rhonda here today to host the blog for you. Today I have a page to share with you that was created with the April Club Q kit. Did you know that our Club Q members get the very newest papers to work with? It's true! These kits featured a new paper collection called "North Woods". The colors are so rich and beautiful! I was inspired to use a photo that I had taken with my friend who introduced me to scrapbooking. We were cropping last fall and they snapped this photo of us. We don't have a lot of photos of us together, and these papers felt perfect for it. I printed a few black and white zoomed areas of the same photo and mixed them in with the one full color image for a focal point. Technique: I used some Biscotti PowderPuff Chalk Ink and stamped with a clock face stamp onto my ivory flowers that came with the kit. A bit of Baja Blue inked over the top of my "Inspiration" script title helped give a bit of a colorful pop. Here I used a small scrap piece of the vellum to slip under the window in the scalloped circular "pie" embellishment. When I started this page, I took the large framed die cut and cut apart the frame from the three circles. I then layered my photos and the vining over the top of the circular anchor. I just love the flourishes that were in this months kit! The relief frame is used vertically and layered on top of the brown patterned paper. By doing this, I was able to get a totally different look from the elements! I also love to use my scraps for extra die cuts that I added in such as the leaves, butterflies and the 2 little flowers you see. Thank you so much for stopping on over today! Enjoy the last day of April!!! This is gorgeous Rhonda. Love the papers and your design! What a gorgeous collection!! 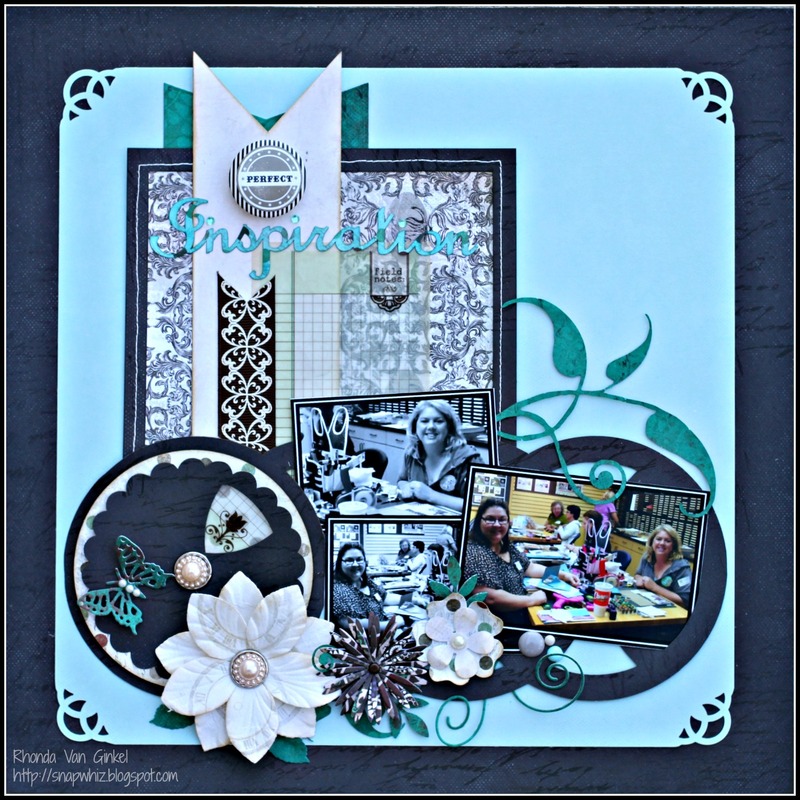 I love all the layering and your elements!! Beautifully done. Fabulous layout out Rhonda!! 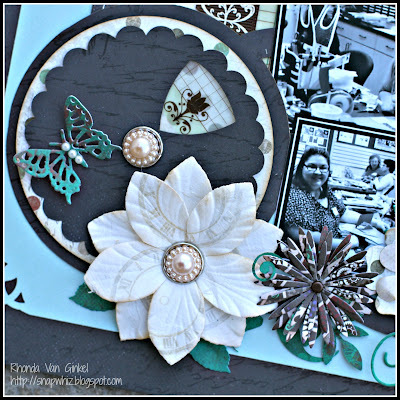 I love the way you stamped on the flower... looks amazing!